I haven't seen that page before that you linked and I don't understand the 2 x double checks? I saw my name in that list twice. What does that mean? Thank you for the tips. I do indeed have 50% usage and I'm using that app_config mentioned on the forum with 0 days work. Yeh Mate what happens is a work unit gets sent to 2 x people to process, to ensure it is accurate by both computers getting a similar result. If say my computer gets it finished and returned before your does, I will be awarded the 1st to return. Then if it is also a prime number work unit, because I was first to return, I will get credited with finding it. Don't worry, I have had quite a few double checks myself, and this shows why it is important to get them back asap. Still technically you get about 1st, 50% or the time, so its still difficult to get a prime, especially if its sent to say someone with a 2080ti, and you have say a 780ti, they will beat you returning the gpu task if you get them similar time. Same goes for cpu, depending what you have, and the way you have it set up. People who hoard work units have a low chance of being first, and therefore don't usually get to be the prime finder, but only a double checker if one turns up. Of course, timed out work units, or aborted ones can make a difference, and here the slower machine can beat the faster one, if they have completed, or nearly completed by the time the faster machine get the work, so really it all balances out in the long run. That page I linked you to was set up just for the Tour, so see how many people actually are double checkers. Notice how scott brown had 7 he found, and 7 double checks as well. Only the 7 he found count towards the Tour for badges and points. Thank you for explaining that Magpie. I guess my AMD cards also aren't really suited to Primegrid either for the GPU WU's. Click on primes tab, beside discoveries, and it will show those 2 x work units we were talking about. Yeah, bloody lucky with those two discoveries, man wish it was the Lotto lol. Weather has cooled down a little bit, so have 3 x PC's running, each doing one workunit using 4 cpus per workunit and 1 at a time, no cache, lots of cross fingers for luck lol. Now it could be another year or two or three before I discover another one lol. Congrats Tazzduke for the second find. I should find another one soon then !!!!! Sooo what about this second WU? It says I finished it 1st but I didn't find the prime number? How does that work? I've switched one of my GPU's over to the Feeling lucky task. Takes about 3 days to run on my Vega 56 which I think will be quite long compared to other GPU's. Guess we'll find out in the next couple of days. I'll then switch it back to GFN - 16. Looks like I'm getting quite a few 1st's for PPSE work units but only 7 - 10 per page of 20 tasks completed with GFN. I guess that's the AMD cards vs NVIDIA which are better suited to Primegrid as I understand it. Have a look at the sent timestamp and the reported timestamp, unfortunately with that workunit you referenced, you ended up being the wingman. Ahhh...this was also on Feb 2nd which was before I followed the instruction and set 0 days work to queue and before using the app_config file. Well done on your prime finds Magpie & tazzduke. I hope you get one soon chooka. LOl… thanks Jugnut. I deserve to find one! Can I get some advice please guys. 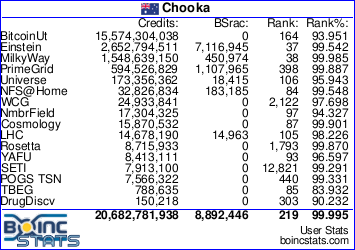 I have my BOINC settings to store at least 0 days of work but for some reason, it keeps queuing up some WU's? Even with 3mins until the next WU finishes, there's another just sitting there waiting. Is that normal? Have I missed a setting somewhere? or does it always download 1 WU ready for the completion of the next WU? I am not sure, is this for the CPU or GPU tasks, do you have both cache settings set to zero??? Store up to an additional 0 days of work. Which is the same one on the forum for the Tour De Primes. BOINC for me downloads the next workunit, when I have less than a minute to crunch on the current one. The only thing I can say is that I have noticed that if I have my computer set to 100% on a 16 thread system and I have the app_config set to use 15 threads then BOINC Manager downloads another work unit, although it cannot be worked on. In the same cenerio if I set the machine to 93.75% which is 15 cores then it only downloads a new task when it get to a minute or less to finish the task it is processing. Not sure why but I guess it thinks there is thread not doing anything but the app_config only says to use 15 ??? You could set a 0% share in the prime grid web preferences, that way you should be guaranteed to just have 1 WU at a time per core. Then it will also be 1 WU at a time for GPU too.